The AD Model has been certified by ITS. This certification mark indicates that the product has been tested to and has met the minimum requirements of a widely recognized (consensus) U.S. and Canadian products safety standard, that the manufacturing site has been audited, and that the applicant has agreed to a program of periodic factory follow-up inspections to verify continued performance. Model AD is ETL Listed under file number 103371695COL-001 and complies with ANSI Z83.4-Second Edition and CSA 3.7-2006 Standards. Recirculating Model AD is ETL listed under file number 3035352-002 and complies with ANSI Z83.18 Standard - Fourth Edition. Direct-Fired Heater with Self-Adjusting Burner Profile Plates is a Patented Product, Patent No. 6629523. The Direct Gas Fired Heater is ETL Listed for use in tempering make-up air. The make-up air is introduced into the heater intake directly from outside the building. Packages are certified to the current ANSI Z83.4 and CSA 3.7 combined safety standard and are available in sizes up to 2,500,000 BTUH and 21,000 CFM. A unique feature of our unit is the patented self-adjusting burner profile plates, which ensure proper air velocity and pressure drop across the burner for clean combustion. Spring-loaded profile plates react to the momentum of the fresh air stream, therefore, no motors or actuators are needed to drive them, nor do they need to be manually set to a specific position. 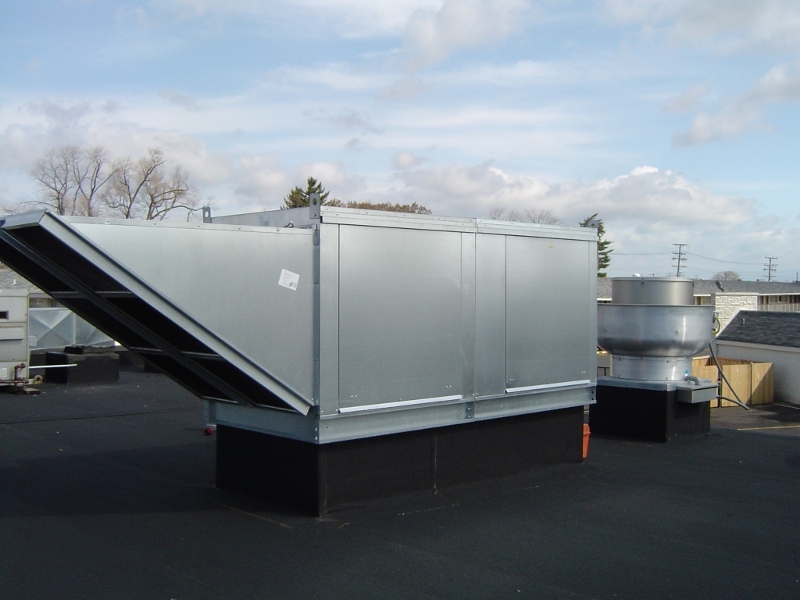 With this feature, all of our units are designed for variable air volume capabilities. Standard features include intermittent spark ignition system with timed safety lockout and redundant gas valves. 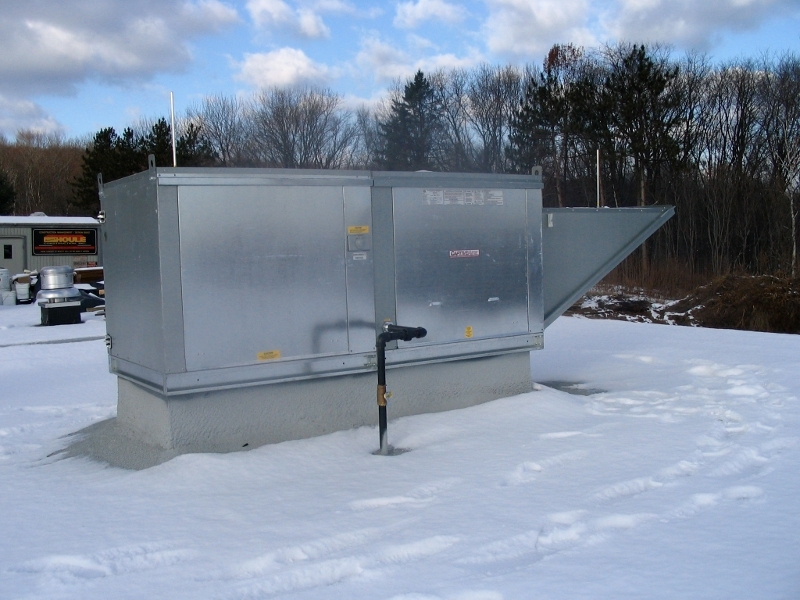 Units consist of a galvanized enclosure with an elevated gas burner which burns directly in the air stream. The burner consists of non-clogging, stainless steel combustion baffles attached to a aluminum gas supply section. The burner is capable of nearly 100% thermal efficiency with a maximum turndown ratio of 30 to 1. The burner module has a standard horizontal inlet and discharge duct connection, and is located upstream of the blower module. 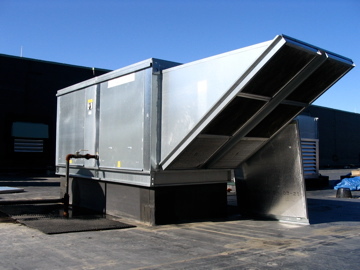 The blower module has a standard horizontal inlet designed to accommodate an outside air inlet hood with standard 2" filters and screen. 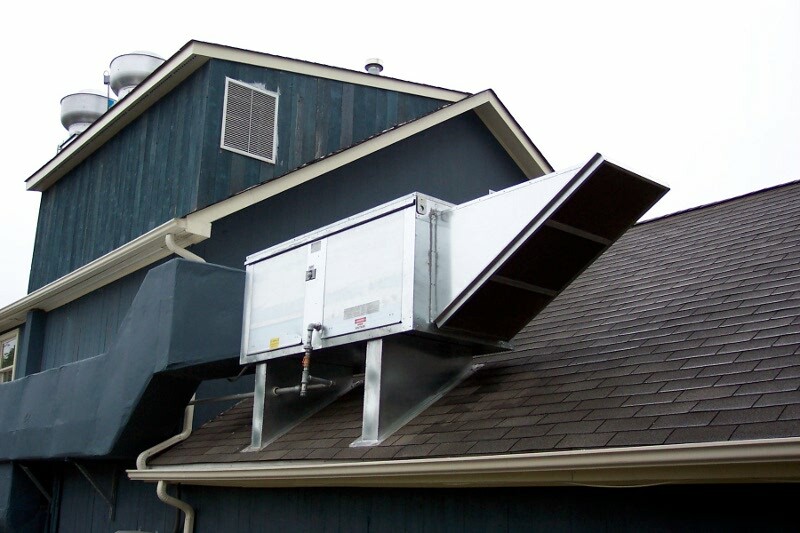 To satisfy a variety of installation requirements, packages are available in a number of configurations which include additions of a v-bank, cooling coil or an evaporative cooler intake module. All modules bolt together to form a rigid common base structure that mounts onto a single curb structure.